Capture the architectural essence of New York City with this magnificent set that brings together the iconic Flatiron Building, Chrysler Building™, Empire State Building, One World Trade Center and the Statue of Liberty, in an inspirational skyline setting. Each individual LEGO® structure is designed to provide a unique and rewarding building experience, with true-to-life color and relative scale depiction. This wonderful model focuses on the amazing architectural diversity of one of the world’smost dynamic cities. Price is 47% below the initial Lego retail price, a € 28.00 discount! This comes down to 5.35 cent per brick. 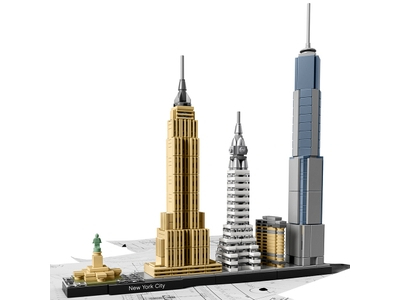 The New York City (21028) Lego set is available from the sites below. However, they do not offer delivery to your selected region. The New York City (21028) Lego set is no longer directly available from the sites below. However, 3rd party partners of these sites might still have the set available. Alternate description Bring together the Flatiron Building, Chrysler Building™, Empire State Building, One World Trade Center and the Statue of Liberty, with the New York City skyline. A LEGO® Architecture interpretation of the New York City skyline. Features the Flatiron Building, Chrysler Building™, Empire State Building, One World Trade Center and the Statue of Liberty. The included booklet contains information about the designer, architecture and history of each building, as well as historical facts about New York City and its architectural heritage. Includes a 4x32 tiled base with decorative “New York City” nameplate.